Hi! I can trade you a Stapelia cutting for a paddle cactus cutting. Would you be interested? The “paddle cactus” is euphorbia xylophylloides. Do you know what variety Stapelia you have? I’m not entirely sure what kind this is. It’s spikes are soft and they don’t prick you. It roots very easily! 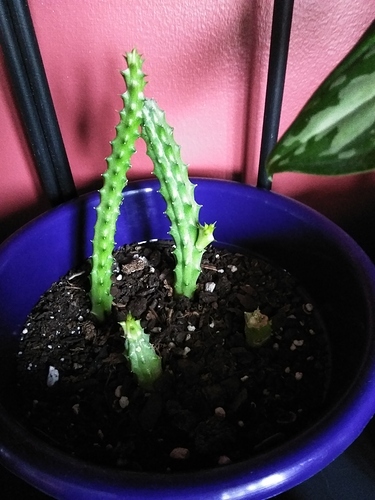 My grandma brought me this cutting from one of her plants. She lives in the south. Do you know what the flowers look like? I’m sorry I have no idea! Since it’s just a cutting and I haven’t had it very long, I suppose I won’t know until this summer.